Both small and large businesses use car wraps to advertise their brand. They find it low-cost and effective to reach their target audience. Vehicle wraps are long-term marketing tools that require you to consider many aesthetic and technical aspects. Only strategically planned car wrap design templates can take your brand message effectively to your audience. Using large vinyl sheets for your car wrap designs reduces cost of changing the advertisement. They do not scratch or chip your paint. Vinyl ready designs make your car a moving billboard. Thousands of people will be able to see your advertisement every day as your vehicle moves around the city. This marketing tactic levels the playing field among small and large businesses. Determine your vehicle’s measurements. Before going to the drawing board, observe your vehicle and take its measurements. Measure the roof, sides, hood, rear and bumpers. Take direct photos of your vehicles’ sides and not from an angle. Make sure the body breaks, door handles, rivets and other extreme curves of your vehicle are clear. This will make it easier for you to see how your ad will fit on the car and how its overall appearance will look to your target audience. 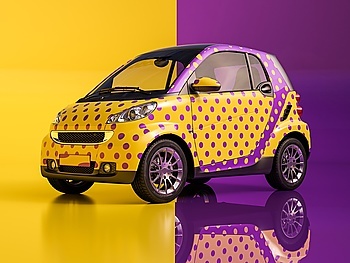 Make sure your car wrap design addresses your brand and market. When choosing vehicle graphic templates, make sure that it matches your brand message. Every image, color, and typeface should be sending the right brand signals to your audience. Your chosen design should build your brand identity. So, make sure that it conveys the right message. Check out your rival’s vehicle wrap design. Any car wrap design that does not stand out from others will not yield good results. A good designer knows the value of a unique design, but comparing your wrap with your competitor can help you create something different – something that will surely catch your customers’ attention. Your chosen design idea should be outstanding and exciting. Consider bold colors. Color is one of the most important design elements. Professional graphic designers know the value of colors in evoking the intended emotions. Choose the colors related to your brand and make sure you use them to impact your viewers. Using bright colors can be a good idea as they can easily be seen from a long distance. Favor bold lettering. Your design should be clearly seen from a very long distance. Big wraps assures quick attention travelling in cars. But if your lettering is small, your target audience will surely miss your message. Use a legible typeface for impact on viewers. Choose amazing illustration and graphics. Aside from your message, the illustration and graphics also helps build your brand identity. Use them to highlight the main features of your products and services easily. When picking the right car wrap design templates, make sure they convey your brand message effectively. Consider colors, typeface and graphics to help get your message across your target audience. Your vehicle wraps should be seen from a long distance. And more importantly, they should stand out from the rest of the cars on the road.